Whow, what a sight. It's the main road of Port Douglas and it's a long one. I haven't seen any tropical road looking so lush and so luxurious. I used to think this was the Canary Island date palm Phoenix canariensis. Then a visitor of this site, Adolfo Polledo, wrote me he knew P. canariensis quite well and this one looked differently. The palms pictured are definitely Elaeis guineensis (African Oil Palm). Back in the '70's a businessman by name of Christopher Skase planted these palms in the hope of commencing an industry extracting the oil, but with the fall of many businesses in the '80's, he escaped to the Caribbean before he could be jailed for corruption. 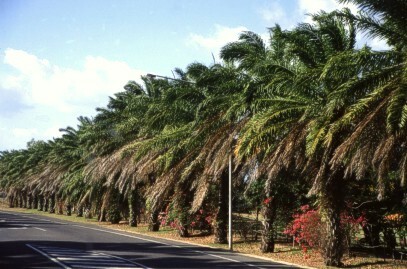 He has since died, but the palms are quite well known all over Queensland and are regularly checked for seed sources. They have grown such a thick trunk probably from the even hot and wet climate they are subjected to regularly. Thank you all for your kind help!